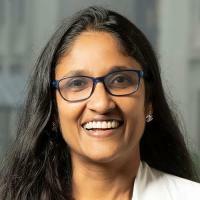 Shyni Varghese has a triple appointment in the Duke departments of Biomedical Engineering, Mechanical Engineering and Materials Science, and Orthopaedic Surgery. She is the first MEDx Investigator. A new initiative of the Pratt School of Engineering and Duke School of Medicine, Duke MEDx seeks to enhance and form new collaborations between doctors and engineers. Shih, YV; Varghese, S, Tissue engineered bone mimetics to study bone disorders ex vivo: Role of bioinspired materials., Biomaterials, vol 198 (2019), pp. 107-121 [10.1016/j.biomaterials.2018.06.005] [abs]. Katrekar, D; Chen, G; Meluzzi, D; Ganesh, A; Worlikar, A; Shih, Y-R; Varghese, S; Mali, P, In vivo RNA editing of point mutations via RNA-guided adenosine deaminases., Nature Methods, vol 16 no. 3 (2019), pp. 239-242 [10.1038/s41592-019-0323-0] [abs]. Kumar, V; Varghese, S, Ex Vivo Tumor-on-a-Chip Platforms to Study Intercellular Interactions within the Tumor Microenvironment., Advanced Healthcare Materials, vol 8 no. 4 (2019) [10.1002/adhm.201801198] [abs]. Zeng, Y; Hoque, J; Varghese, S, Biomaterial-assisted local and systemic delivery of bioactive agents for bone repair., Acta Biomaterialia (2019) [10.1016/j.actbio.2019.01.060] [abs]. Hoque, J; Sangaj, N; Varghese, S, Stimuli-Responsive Supramolecular Hydrogels and Their Applications in Regenerative Medicine., Macromolecular Bioscience, vol 19 no. 1 (2019) [10.1002/mabi.201800259] [abs].